Estimated Mileage 968,600 miles under SR/BR. Preservation Millage TBD. What’s unique about 31806? It’s the only surviving K class rebuild and currently the only U class operational. K Class River Cray after the Severn Oaks Crash that bought both of the Swanage Us in to being. 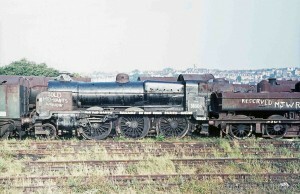 31806 was originally built as a K class 2-6-4 tank engine. They were all named after rivers in the region and No A806 was named “River Torridge”. Constructed at Brighton Works, it entered traffic in August 1926. 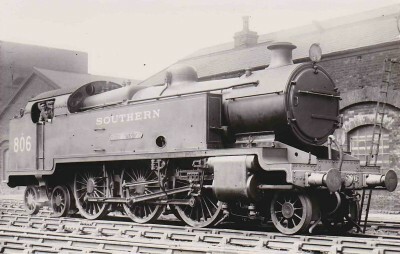 After trial runs on the Brighton section it was assigned to the eastern region of the Southern Railway. The K class or ‘River Class’ were designed by Richard Maunsell as the fast passenger counterpart to the N class. They were designed together and standardisation policy dictated they use the same boilers, cylinders, motion and as many other parts as possible. In fact, the weight limitation of the K class with its side tanks dictated the maximum size of the boiler on the N class which otherwise could have been larger. The K class 6’ diameter wheels gave them extra speed but the side tanks limited water capacity and restricted their use on longer routes. They also gave them a high centre of gravity and a tendency to roll heavily on the poor track of the day. They gained the nickname ‘the Rolling Rivers’ after the lyrics of ‘Old Man River’. There were a number derailments culminating on 27th Aug 1927 when No A800 ‘River Cray’ was involved in a tragic incident. 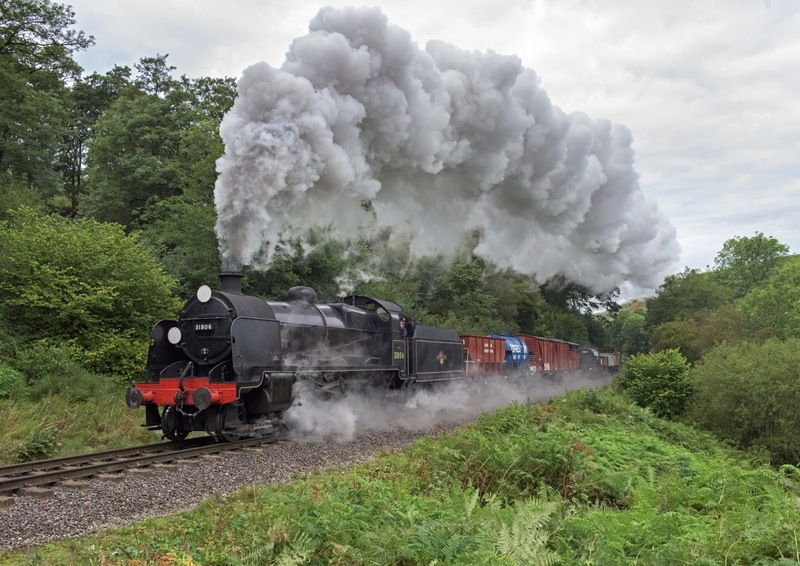 Approaching Sevenoaks at nearly 60 mph it started it rolling on poor track. The front coupled driving wheels rode up and over the left hand rail. Alerted by the sound of the wheels running on the rail chairs, the driver immediately closed the regulator but before the train could be slowed it burst a set of trailing catch points causing complete derailment of the loco and all 8 coaches. As it travelled on under the Shoreham Road bridge leaning to one side, the the loco and wooden bodied coaches struck the bridge abutment causing the train to split. The loco and front three coaches continued another 100 yards finishing on its side. Coach 5, a heavy Pullman crushed coach 4 against the bridge. The reset of the train telescoped in to the back of the Pullman. Thirteen people died, and the entire class of 20 locos were immediately withdrawn from service. Although the inquiry report was inconclusive, the River Class received a lot of bad publicity and the recommendations included reconsidering the necessity to use side tanks. At the time of the incident the designs for the U class, a tender version, had already been completed and in early 1928, before the ink was dry on the report, it was decided that all 20 K class tank engines should be rebuilt as U class tender locos. The rear pony truck, side tanks and coal bunker were removed and set aside for future use. The back of the frames and cab were cut back and a drag-box inserted. This additional work came on top of another batch of 50 Ks ordered before the accident that were also now being built as Us so the order for seventy 3,500 gallon tenders was outsourced to Armstrong Whitworths. Number A806, thus transformed, re-emerged from Brighton Works on the 21st June 1928. The River names were quietly dropped. Of the four U class locos surviving in preservation, 31806 is the only one from the 20 K class rebuilds. If you know where to look you can still see the evidence of its earlier life in another form. The differences include the twin spectacle windows in the cab, a lower running plate (to accommodate the side tanks) and the scallop in the rear of the frames under the cab where the rear bogie was. Its first shed allocations are not known but its works record card record it being at Nine Elms on 21 March 1932. When the final batch of U’s were built between 1932-1934 the class numbering was rationalized. The prefix ‘A’ was dropped from the start and replaced with a ‘1’. Our loco left Ashford works paint shop on the 1 Sep 1932 bearing number 1806. It was either this visit to the works or the subsequent one in December 1934 that it acquired the distinctive ‘half height’ smoke deflectors. One source records it being allocated to Basingstoke in 1939. It’s record card has Redhill pencilled in, and if we assume this was the last depot when the card was filled the date would be 1944. In 1945 it’s recorded as having minor repairs at Guildford shed and was already based there following nationalization on the 1st January 1948. After nationalization the locomotive was renumbered as 31806 leaving the paint shop on the 1 April 1949 painted in to BR Mixed Traffic Black. In 1953 its tender was swapped for a new 4000 gallon type. 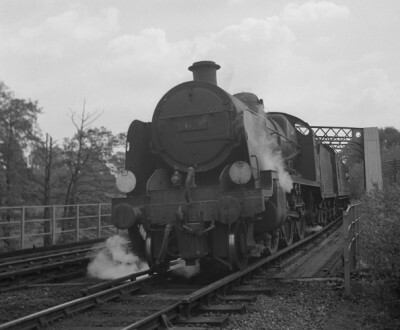 It moved back to Nine Elms in 1954, then to Basingstoke in 1955 and was photographed on the Swanage Branch several times during this period. 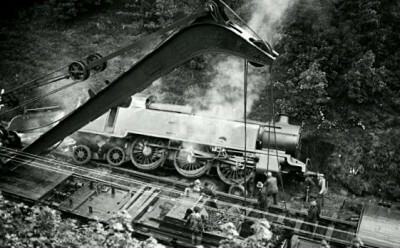 By the late 1950’s a number of the class were suffering from worn out cylinders and cracks in the light weight frames. 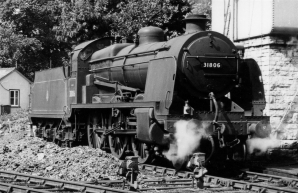 In September 1957 having run nearly 836,000 miles 31806 went to Ashford Works to receive a ‘new front end’ comprising BR type 4 cylinder blocks, chimney and blast pipe. The BR cylinders have an outside steam pipe and different mounting holes requiring the front section of the frames to be changed as well. The Davies & Metcalfe Exhaust injector was also removed from the LHS and instead two live steam injectors were fitted to that side. It’s tender was swapped again back to the same 3500 gallon tender it was given when converted from a K class. It returned to traffic 1st November. 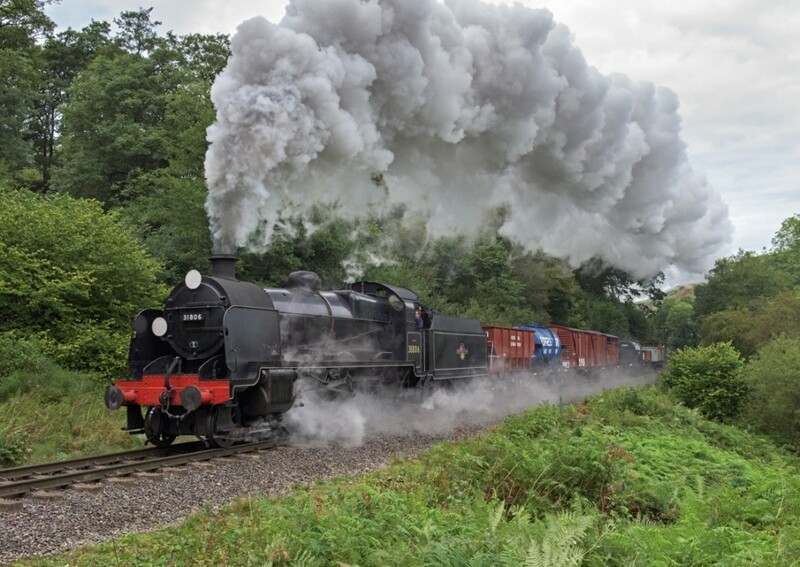 The last modification in its working life was the fitting of AWS at some time between 1957 and April 1963 when it moved back to Guildford again. 31806 was retired on 5th January 1964 from Guildford Shed after 34 years & 7 months service, and nearly 1 million miles. In June of the same year it was towed to Woodham’s Scrapyard at Barry, South Wales where she languished for over 12 years. 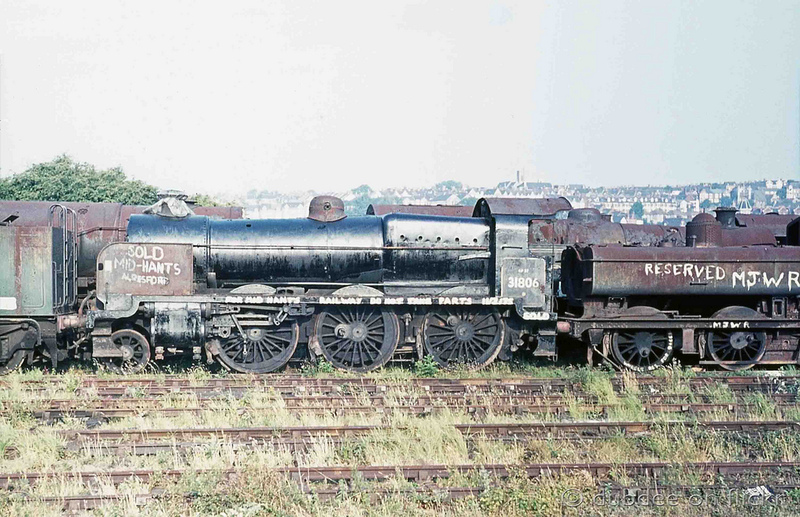 Like a many other locos in Barry, she lost her tender, probably for use as an ingot carrier at Briton Ferry steel works. Eventually purchased for preservation at the Mid Hant’s Railway, it left in October 1976. The 85th loco to leave the yard, restoration started in 1979 and the locomotive re-entered service April 1981, with an ex-Barry tender number 851 from S15 30499 which in turn had only acquired it days before being withdrawn. During an intermediate period waiting overhaul 31806 loaned the tender and some of her motion to 31625 to enable it to run mainline. 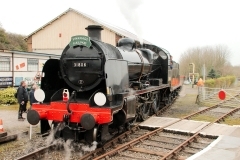 Its tender was being worked on in Ropley carriage shed when it was damaged by the fire that destroyed the shed in 2010. 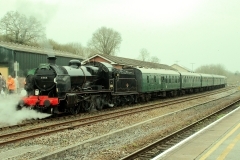 After overhaul 31806 re-entered traffic on the Mid Hant’s in 2011. In 2014, U 31806 transferred to Swanage, along with U 31625 & N 31874. The Swanage Railway is very pleased to have the loco as part of its resident fleet. It’s efficient, easy to maintain and very popular with the crews. It’s currently the only operational U and is popular on the Gala circuit. It’s Boiler ticket expires in 2021. Your support will help to maintain it and ensure a swift overhaul when the time comes. Please visit our donation pages. 31806 is the oldest of only 4 surviving U’s in preservation and the only one from the first batch converted from River tanks.